This is a big operation in every sense of the word. 2 top courses (Old and New) scattered over a wide area, big clubhouse, big associated facilities like gym and tennis. Big everything, basically. 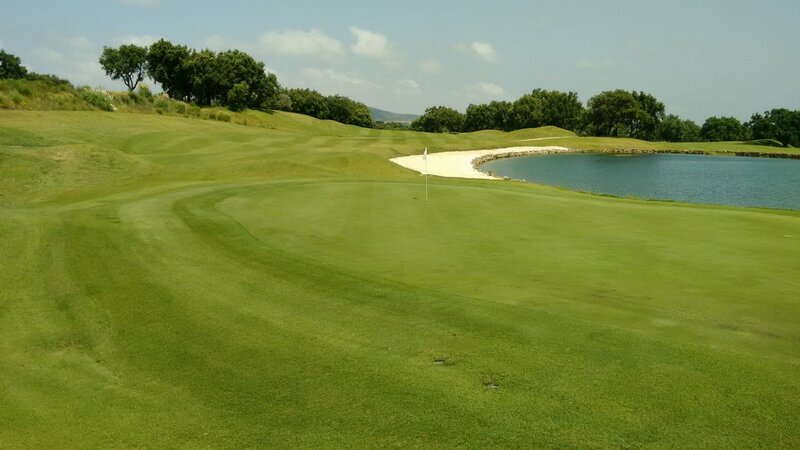 San Roque has hosted large national professional golf tour events. With significant membership costs, you expect everything here to be premium – and you get it. But not in a condescending way if you are a visiting golfer – which is very important to me. Service is relaxed and professional. The Old course is consistently a bit more expensive than the New course. The New course might show reasonable variability in price throughout the year, the Old course much less so. There are small concrete hole maps on every tee. A club at this level expects you to buy a detailed course booklet in the clubhouse if you want accurate hole layouts and distances. I do not agree fully with that. This is a tough course. Relentlessly demanding. The difficult holes just keep on coming, particularly the par 4s which are all very high standard. No easy holes at all. Every shot is quite tricky in one way or another. Start with the terrain of this course. This is meandering up and down. Nothing particularly steep, but lots of little hillocks and bumps. So lots of areas where you can get a fairly unpredictable bounce or uphill/downhill lie. Most areas off fairways are fairly sparsely grassed, so the ball can skitter off into a grove of mature cork oak trees (particularly so because the fairways are quite dry and the grass there has little grip). But the rough is not just that – on some holes really dense bush lines one side of the fairway. On other holes there are water hazards that are absolutely in play – definitely not just decorative. So there is plenty of innate difficulty in the natural features of this course – landscape and natural hazards. But it gets even harder ! Firstly, fairways are narrow. Your target line off most tees is very small indeed, and quite a few tee shots are over a blind rise. Secondly, there are a great number of bunkers on this course. Some individual holes have more than 10 bunkers on them. And these are not trivial bunkers. Some small and potholed, others vast (nearly 100 meters long). The sand in the bunkers I thought coarse-grained and required a really strong swing of the sand wedge - but still nicely playable. So before you even get to the greens you have undulating terrain, narrow dry fairways, lots of bunkers and other hazards. The greens are medium-large and on the days I played medium-fast. But I suspect that was just timing. The grass on the greens is very high quality and if they mowed it carefully, they could make the greens racey fast. All greens have moderate slope and there is plenty of scope for tough pin positions. I do not think the greens are 'stupidly tough' (e.g. a very large multi-tiered green where one putt can miss the pin and end up 5 meters away), but it is easy on this course to miss a putt and end up 2-3 meters away. Pitching though I think is where you can make up shots. Very few greens are raised so provided you have missed all the hazards before the green, pitching (even if long distance) is where you can plan to tame the hole. If you can get 1 pitch plus 2 putts, you are doing OK. If you can get 1 pitch and 1 putt you are doing really well because on average you are making up shots you let slip away elsewhere. So – relatively speaking – pitching is one of the few easy aspects of this course that you can attack. The overwhelming requirement to play this course is accuracy - hit narrow fairways and avoid hazards. To my mind, that rules out most golfers with handicap 25+. 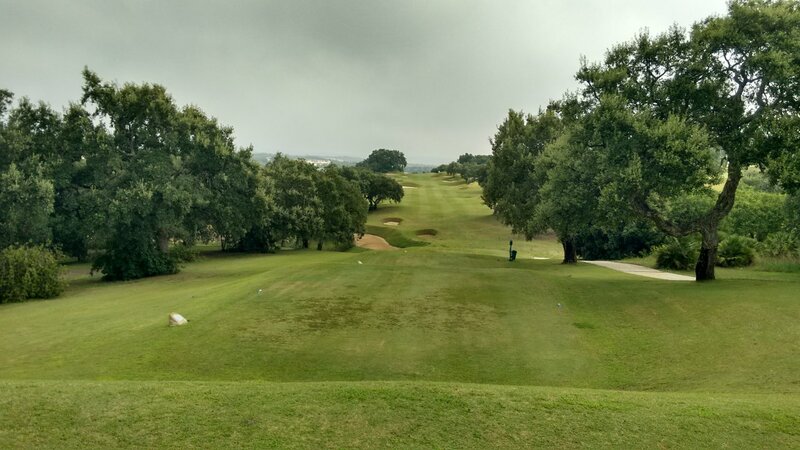 Sure those players might like to visit a demanding golf course like San Roque New compared to the relatively flat and forgiving golf courses they normally play, but I doubt 'enjoyable' would be how they describe the experience. I think this is a very good course for 10-20 handicap players. A real challenge for them. If there is one negative feature of this course, to me it is the grass particularly on the fairways. This is reasonably scruffy and not up to the standard that the San Roque experience projects. Also this course is uniformly hard, rather than having a few stand-out signature-type holes that offer the best golfers a real challenge. So a very good golfer (5 handicap and under) might say "Nice course, but not really championship level and condition". Still for me personally as a mid-handicap player, this is a course I really respect. I think the design of every hole is subtle and complex. Every par score to me here is a small triumph. A course I go back to happily – provided it is a still day. On top of all the hazards already there, the last thing I need is strong wind making the course tougher than it already is. 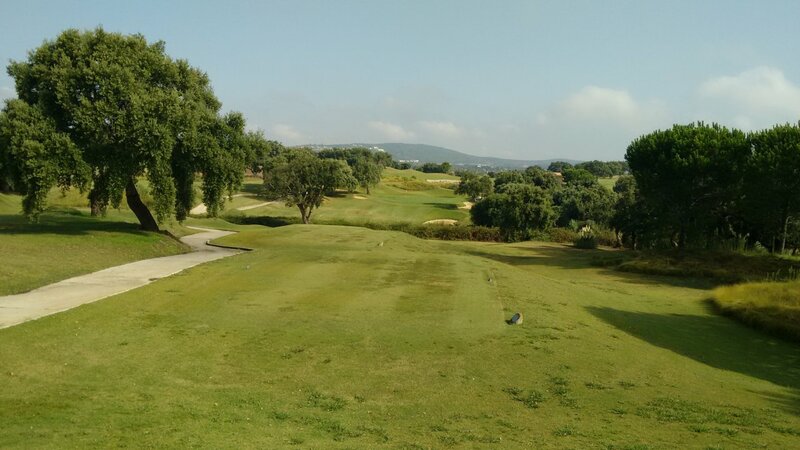 I personally prefer the Old course at San Roque to the New course, price differences aside. Review last updated: August 2015. Number of times played: 3. The San Roque New course is represented by the yellow dot, the San Roque Old course is represented by the brown dot. Both courses are 'top 5' in length compared to all other courses on the Costa del Sol. Both courses are 'top 10' when it comes to difficulty, with the Old course coming in as the 3rd most difficult course on the Costa. An 18-handicap player can expect to go around the New course in 21 shots over par, and the Old course between 22 and 23 shots over par.